University of Maryland’s Pratyush Tiwary, an assistant professor of chemistry and biochemistry with a joint appointment in the Institute for Physical Science and Technology, is one of 30 early-career scientists named to the 2019 “Future of Biochemistry” list in the journal Biochemistry. “As a theorist, receiving this award is really nice because it means the community feels that my tools can be used to make a real impact in biochemistry,” Tiwary said. Tiwary develops methods for simulating the behavior of molecular systems, such as proteins, on the atomic scale. These simulations have applications in many areas, including the pharmaceutical industry. Drugs interact with their targets for a fraction of a second, which is too short for scientists to easily observe in the laboratory. Tiwary simulates these interactions using statistical physics. In particular, he uses statistical mechanics, a branch of physics that uses mathematical and statistical tools to describe how large groups of atoms or molecules physically behave, which allows scientists to observe the interactions for as long as needed. However, calculating a millisecond’s worth of an interaction can take a year, even on a powerful supercomputer. To address that obstacle, Tiwary combines artificial intelligence with statistical mechanics. Tiwary first learned about using statistical mechanics as a tool for materials science research as a student at the Indian Institute of Technology in Varanasi, where he earned a B.Tech. in metallurgical engineering in 2007. At the California Institute of Technology, where he received a Ph.D. in materials science in 2012, Tiwary became interested in applying statistical mechanics to other fields such as chemistry. 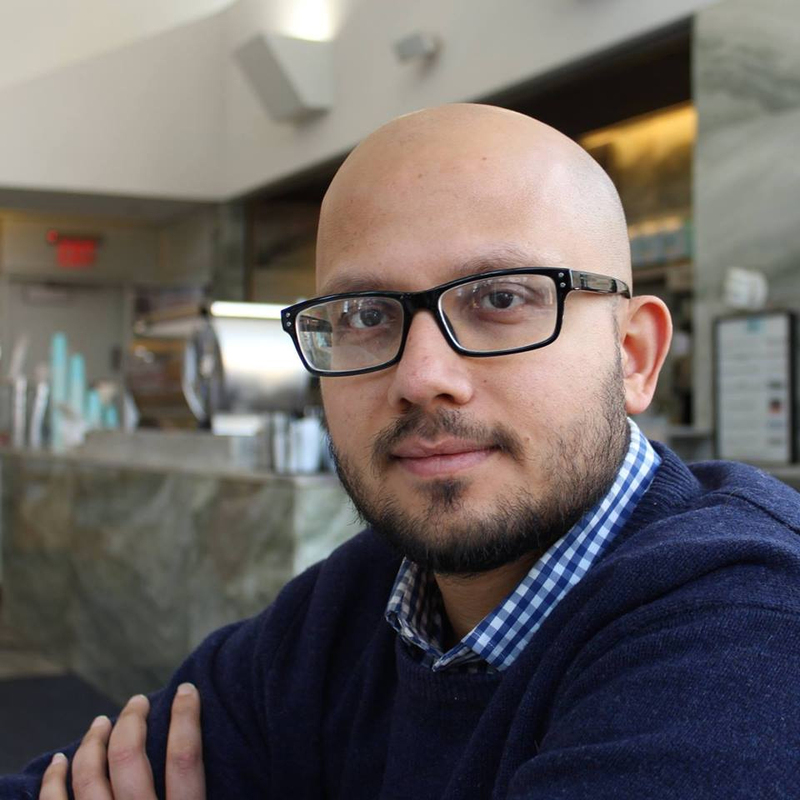 Then, as a postdoctoral scholar at the Swiss Federal Institute of Technology (ETH) in Zürich and at Columbia University, Tiwary further explored the intersection of statistical mechanics and chemistry. In 2017, Tiwary joined UMD to build on the university’s pioneering efforts and strengths in the field of statistical mechanics, while also exploring its intersection with other disciplines like data analytics and computer science. Although Tiwary calls himself a theorist, he firmly believes that his simulations should help people in the real world. For instance, Tiwary collaborates with Charles Vinson at the National Cancer Institute on a project funded by the NCI-UMD Partnership for Integrative Cancer Research. They are searching for the binding target of Zta, a protein found in a common virus called Epstein-Barr. Zta is a transcription factor, meaning that it binds to and activates specific sequences of DNA. However, scientists do not currently know what those sequences are, even though they believe that the sequences are extremely important. Going forward, Tiwary hopes to apply new simulation methods that he and his group developed toward drug discovery. With the help of artificial intelligence techniques, these methods successfully modeled a small molecular system that mimics a drug binding to its target in one-twentieth of the amount of time needed by other popular methods. Tiwary published a pilot study on these methods in The Journal of Chemical Physics in May 2018. In December 2018, Tiwary followed up with a study in the Journal of Chemical Theory and Computation that successfully used the methods to model a small molecule unbinding from lysozyme, an enzyme that protects people against bacterial infection. The research paper, “Toward Achieving Efficient and Accurate Ligand-Protein Unbinding with Deep Learning and Molecular Dynamics through RAVE,” João Marcelo Lamim Ribeiro and Pratyush Tiwary, was published in Journal of Chemical Theory and Computation in December 2018. The research paper, “Reweighted autoencoded variational Bayes for enhanced sampling (RAVE),” João Marcelo Lamim Ribeiro, Pablo Bravo, Yihang Wang and Pratyush Tiwary, was published in The Journal of Chemical Physics in May 2018.